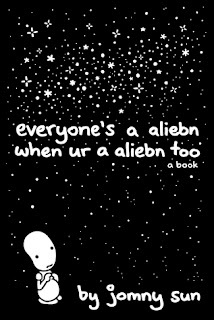 In this graphic novel, a sad lonely little alien is sent to Earth to study humans. He meets all sorts of "humans" including a tree, a bear, an egg, some bees, a turtle, a dog, and some very smart otters. He feels more at home among all these various earthlings than he does with his own people, who check back on his progress from time to time. They don't seem to think he's doing very well fulfilling his duties, but the little alien is learning so much about friendship and feeling good about oneself that it hardly matters. This book is apparently based on a Twitter account, which I haven't even checked out since the book is so cute I can't imagine how it would come through on Twitter. I mean, I can imagine and it doesn't seem like the sort of account I'd enjoy following. But I love it as a book. It's a simple, but also profound. It's adorable, sad, hopeful, and philosophical. It's right up there with Hyperbole and a Half on my just-now-formed list of graphic novels to read when you need to lift yourself out of despair. Graphic novels always leave me a loss when I'm trying to blog about them. They're so visual and contain so few words, and somehow that translates to me not being able to find enough words to talk about them. So I'm just going to leave you with photos of some of my favorite pages.